Do you want to experience more connection, more wonder and more creativity in your life? Always running from one thing to the next, without taking time to pause, process and fully appreciate the moment? Spending too much time staring at screens, longing for some time to stop and think and simply be? Overwhelmed by your to do list, feeling like you’re surviving, rather than thriving? So busy taking care of the needs of others that you’ve forgotten what truly nourishes you, body, mind and soul? Recalibrate your compass to a point on the horizon that inspires you? Reconnect with your creativity, your imagination and your ability to dream bigger? Reset, recharge and re-commit to what really lights you up? Have more energy, more fun and feel like life is an adventure again? I am here to guide, support and champion those who find themselves at thresholds in their lives, both big and small, and help you to let go of that which no longer serves you, while aligning with what you really want to be and do. With some simple, powerful tools, the space and time set aside to explore what’s possible, and a truly committed guide by your side, you too can - and will - remember how to see the magic in the mundane. I will work with you to create your perfect experiential journey, incorporating creative coaching, intuitive guidance and a practical yet spiritual toolkit to send you on your very own adventure into creating a life you love to live. From an afternoon in an ancient forest finding invisible portals into other worlds to embarking upon a whole new start in your life or work, this process is powerful, playful and uniquely designed to fit your needs. Come on a unique, bespoke journey and master the art of transforming your perspective and shifting your focus to find the wonder in the everyday world . My clients come from all backgrounds, values and beliefs. They feel the need for someone to help guide them over a threshold in their life - to wake up their wonder, reconnect to their creativity or to let go of the old and open to seeing their world anew. They are often going through some kind of transition, be it professional, personal, physical, emotional, psychological or spiritual. But they may just be curious. Or ready for adventure. What unites them is simply a sense that it is the right time, that they are ready to explore a new way of seeing, being and doing - and that they have a hunch that I am the right person to walk alongside them as they step into a new chapter, whatever it may be. I offer 3, 6, 9 and 12 month packages, which can be tailored to suit your needs. Every journey starts with a full one to one session, in person. After that, we can work out a schedule that fits you and the way you prefer to work with me. This takes place in person, in my home, on my gorgeous houseboat in London, and it is a session that will cover all sorts of areas, spanning everything that you might want to explore, release and create over the weeks and months ahead. In this bright and beautiful place, you will get a chance to rest, breathe, take some space and share from the heart about what brought you to this point - and where you think you might like to go from here. The first session gives you plenty of time to unpack whatever is going on and what you would like to shift, transform and explore over our time together. And it’s not just about having some much needed space to think. It’s also about creating a bespoke plan - a treasure map - that might just change your life. You will go away with a whole bunch of suggestions, tools, ideas and inspiring actions, which will be uniquely designed to make you feel creatively curious, imaginatively inspired and ready to take your first step along your very own sparkly path. We will then embark on a series of regular sessions that take place in person (vastly preferable) or via a screen. These sessions are always intuitive, imaginative and designed for your particular passions, interests and creative explorations. As we go, we will agree on actions and mini adventures that ensure you are following a truly inspirational path, step by sparkly step. So…what would you like to explore? Calling all caterpillars that are ready to be butterflies. This is a series of one to one sessions that will take you through a profound life shift, carrying you through a fundamental metamorphosis as you transform any or all areas of your life, from your work to your relationships, your creative expression to finding your unique spiritual path. From the start of your journey, to the celebration of your completion, I will be here supporting you along every twist and turn of the way, to help you step fully into a life, that inspires, delights and nourishes you, mind, body and soul. A minimum of 6-8 sessions is advised over the course of at least two changes of the seasons. Discounts for bulk bookings are available. Are you embarking on a new creative project? Would you like to have someone there to provide an imaginary arm around your shoulder, cheering you on as you go from conception to creation to completion, helping you keep your eye on the horizon, stay true to your vision, dissolve any blocks you encounter and celebrate your milestones along the way? Whether it is a novel, a movie, a podcast, an album, a painting or an artistic adventure into the unknown, the process of creating something new can be exciting, emotional, delightful and daunting - and a whole lot more fun if we have the right kind of support for the ride. For over a decade, I have been reminding people of all artistic disciplines and all levels of experience how to access their creativity, supercharge their ideas and connect to their innate playfulness as the key to sustainable inspiration. What if, in just a few hours, you could not only experience but master a simple, transformative technique that will revive your creativity, restore your soul and reboot your senses, all the while filling your lungs with clean, forest air, and practically on your doorstep? The Wonder Walk is a stand alone session which you can experience slap bang in the middle of your city, your day and your no doubt hectic life. You will learn a simple and powerful technique that will enable you to step through invisible portals into other worlds – quite literally. It will leave you feeling connected, creative, inspired and able to access your sense of wonder. It takes place in an ancient forest, a short walk from a tube station in London, Zone 2. 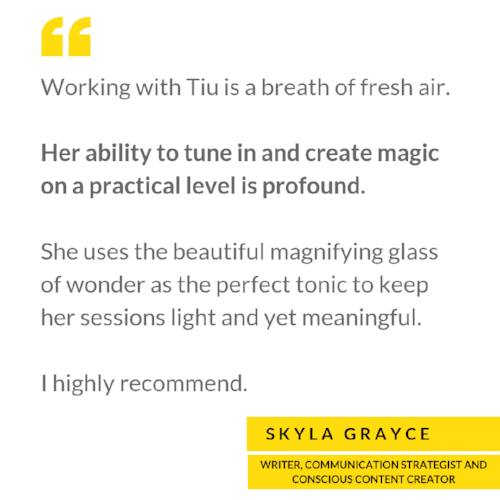 Get in touch if you would like to gift someone a beautiful, powerful, bespoke 2.5 hour session to help them connect with their creativity, design a unique ritual or simply explore how to access their wonder.